The tyre pressure monitoring display in the instrument cluster informs the driver if the tyre pressure is too low or a system malfunction has occurred. The tyre pressure monitoring system makes use of the ABS sensors to compare the rolling circumference and the vibration of the wheels. The display in the instrument cluster alerts the driver if changes are detected on one or more wheels. 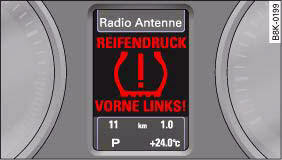 If only one tyre is affected, the display will indicate its position ⇒ fig. 27. Each time you change a tyre or the tyre pressures on your vehicle, you must store the new tyre pressures via the sound system or MMI*. If the warning lamp flashes for about a minute and then remains lit after you switch on the ignition, there is a fault in the system. 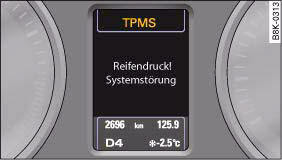 TPMS (Tyre Pressure Monitoring System) Tyre pressure ! System malfunctiongggggg 40, fig. 28 will also be displayed in the instrument cluster. Please contact the nearest qualified workshop as soon as possible. • If the tyre pressure warning lamp appears in the instrument cluster display, slow down immediately and avoid any severe braking or steering manoeuvres. As soon as you can do so safely, stop and check the tyres and the tyre pressures. • It is the driver's responsibility to ensure that the tyre pressures are correct. For this reason you must check the tyre pressures regularly. • Under certain conditions (e.g. driving at high speeds, on ice and snow or on poor road surfaces) the tyre pressure warning lamp may not light up immediately or not at all. When you change a tyre or the tyre pressure on your vehicle, you must store the new tyre pressure via the sound system or MMI*. – Select: Function selector button CAR > Tyre pressure monitoring > Store tyre pressures.